Rancière is everywhere – not just at colloquia, lectures and seminars but also in many places in the thinking of philosophers, art theorists and artists. As of a few months ago, his work is finally available in Dutch. 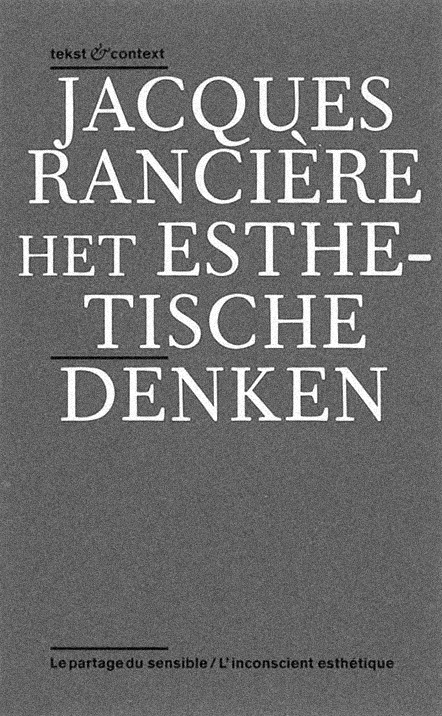 After Jan Masschelein’s translation of the staggering astonishing Le Maître ignorant (De onwetende meester, with an introduction by Masschelein, Acco, 2007), Walter van der Sar has translated Le Partage du sensible and L’Inconscient esthétique for Valiz, both texts collected together in Het esthetische denken (‘Tekst’). This and Grensganger tussen disciplines (‘Context’), which includes an interview with and three essays about Rancière, form a handsomely produced diptych that is the first publication in the series ‘Tekst & Context’. This new book series, edited by Solange de Boer, has the ambitious aim of bringing greater breadth as well as greater depth to debates about art and art criticism in Dutch-speaking countries. A key element of this effort will be translations of key international texts and reflective essays accompanying them. It goes without saying that Rancière’s oeuvre has elicited a great deal of response in contemporary art criticism. The answer to why this disciple of Althusser has become so influential in today’s debate on art and politics is as complex as it is significant. In many regards, after all, Rancière is an anachronistic philosopher averse to philosophical trends or disciplines who writes only indirectly about current aesthetic or political issues. A straddler of boundaries, he primarily conducts ‘archaeological’ research into the way art practices are conceptualized and made visible, and by doing so he identifies the symptoms of the contemporary art discourse. The power of his oeuvre lies in the fact that this research, rather than describe a static past, consistently emphasizes the potential of art and aesthetics. The selection of Rancière to launch this series is fully justified by the mere fact that this emphasis makes him anything but a defeatist. He rejects the ‘paltry dramaturgy of ends and recurrences’ (‘Tekst’, page 13) that dominates the contemporary discourse on art and politics and turns art critics into pathologists whose job it is to probe into the life and death of art in eloquent fashion. When he addresses the bankruptcy of such oft-used categories as modernity, modernism, postmodernism or avant-garde, he does so mainly to introduce a number of historical and conceptual premises of his own, intended to place art history and art criticism in a different light. The crux is what he calls ‘the aesthetic regime of the arts’, and it is precisely this regime that both Le Partage du sensible (The Distribution of the Sensible) and L’inconscient esthétique (The Aesthetic Unconscious) examine in detail. This aesthetic regime, according to Rancière, came into force in the early nineteenth century, when art was acknowledged as an autonomous and discrete mode of being that is ‘filled with a heterogenous power, the power of thinking that is alienated from itself’ (‘Tekst’, page 32). Once art is no longer defined by conventions of taste or by the hierarchy of subjects, genres or arts, it was able to become a reflection of a project of political emancipation, in which what was not observable within the existing order of sensory experience (the sans-part, the meaningless and voiceless) became recognizable through an ‘aesthetic revolution’. Despite what this all too simplified outline of Rancière’s thinking might suggest, his alternative approach does not lead to unjustified simplifications. On the contrary, he meticulously analyses the various and often conflicting plot lines of the ‘aesthetic regime’ (for example, Balzac’s view of ‘the prose of the world’, whereby every object, no matter how trivial, possesses a capacity for poetry and meaning, and Maeterlinck’s contention that every stage dialogue conceals an inaccessible, incomprehensible and pointless drumming that expresses the anonymous, meaningless forces of life, turn out to be two sides of the same coin). He elaborates these in compact and finely crafted theoretical facets that constantly mirror one another throughout all of his writings – a hall of mirrors the reader is glad to get lost in. In the lucid essay that concludes the ‘Tekst’ volume, Sudeep Dasgupta calls this method ‘spiral-shaped’. Rancière’s contrarian way of working embodies the dislocation of the traditional orders and the shifts in the concepts of politics and aesthetics he has in mind. To Dasgupta, the fact that Rancière’s thinking has been called a misplaced philosophy (une philosophie déplacée) has anything but negative connotations. On the contrary, Rancière’s oeuvre calls for a creative potential to transform forms of sensory experience into new spaces, so that a common stage can be created. The greatest virtue of ‘Context’ is its clarification of several of the twists in Rancière’s spiral thinking that are developed in ‘Tekst’. This is accomplished first by contextualizing Rancière’s texts within his oeuvre, with a key role played by 1987’s Le maître ignorant (The Ignorant Schoolmaster) in both Pablo Lafuente’s and Mireille Rosello’s essays – not surprisingly, given that it deals with two leitmotifs, ‘emancipation’ and ‘equality’. Rosello tests the pedagogical experiment of the nineteenth-century Jacotot against the topicality of a multicultural society, while Lafuente traces the Romantic roots of Rancière’s ideas about emancipation. The most explicit answer to Rancière’s call to recalibrate the discourse of art history and art criticism is provided by Sven Lütticken. His highly critical text argues that today’s art regime is no longer ‘aesthetic’ (à la Rancière) but logocentric or transparent. A recurring criticism of Rancière is that his ideas on politics has nothing to do with actual political practice, that his aesthetics are too abstract and this emancipation project is nothing more than a utopian conceptual exercise. However divergently constructed the essays in ‘Context’ may be, each challenges this criticism in its own way. They demonstrate that his thinking, like his concept of emancipation or equality, has a performative character: the translation of knowledge into practice should not take place in the theory of the schoolmaster-author but in the practice of the reader who grapples with this theory. Through his work, Rancière wants to dismiss ‘scenarios of historical necessity’ and concentrate on ‘the archaeology of our time as a topography of possibilities that retain their quality of possibility’. (‘Context’, page 85) The first instalment of ‘Tekst & Context’ certainly represents a worthy introduction to that project. Frederik Le Roy is a philosopher (K.U. Leuven, Ghent University) and theatre scientist (Ghent University) and has been affiliated with the department of Art, Music and Theatre Sciences at Ghent University since 2005. He is working on a PhD on contemporary theatre as a technology of memory.